Unwanted material has a habit of building up over time, no matter where you live. Over the years, you may find your home cluttered with all kinds of objects for which you no longer have any use. Inside, old objects you no longer use and leftovers from past renovations or other projects around the house can pile up and intrude upon space you would rather use for more productive endeavors than storage. Even outdoor projects can result in significant amounts of junk, from grass clippings and other yard waste to sand, dirt, and building materials. Throughout the state, people rely on dumpster rental in MA to provide a cleaner property and greater peace of mind. When you are thinking about renting a dumpster in Boston or another part of MA for home use, it is essential to make sure you are well prepared for the task. Renting a dumpster can seem very simple in principle. However, the more you know before your dumpster rental, the more confident you will be about your choice of rental company and the more efficiently you can use your dumpster when it arrives. 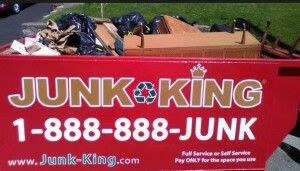 Junk King is a leading waste removal company in MA and many other states across the US. For your convenience, we have put together a comprehensive guide to dumpster rental in MA for home use. Read on, and discover how our experience and knowledge can help you make better choices about your waste removal solutions. By the time you have finished this article, you should know more than enough to rent a dumpster properly and use it for maximum de-cluttering around your home. When Should You Consider Dumpster Rental in MA? One of the first questions that MA residents have when they think about dumpster rental is when it should be arranged. Many homeowners think of getting a dumpster as the kind of thing that should only be resorted to when the level of material on their property is utterly overwhelming, but in fact, this is not the case. In fact, abstaining from renting a dumpster until you are almost literally swimming in junk can cause more problems than it solves. There is no need to wait until your home becomes practically unlivable before you contact a company to provide you with a handy solution. Many people assume that they need to wait until they have more junk because they want to make sure they can “get the most for their money”. However, they fail to consider that in many cases, this approach will make their rental period more expensive. Several different pricing models exist for dumpster rental, but they can all result in higher prices for larger jobs. If your company charges by the day and it takes you a week to clear all the junk out of your home, the cost can be much more troublesome than if you had split the same task into several dumpster rentals at different points of the year and budgeted for them accordingly. Likewise, if the rental company charges by weight you can end up with a hefty fee for a container full of material. At Junk King, we charge based on the amount of space your content takes up in the container, which we measure in square feet. This allows you to save money by packing the container efficiently, but it also means that you can hire a dumpster cost-effectively on smaller jobs, and avoid letting your place become inundated with junk. Are there Other Ways to Rid Yourself of Junk Besides Renting a Dumpster? Those of you who are thinking about dumpster rental in MA are probably also interested in other options for waste removal. There are typically two strategies for disposing of waste in the state without renting a dumpster: doing it yourself or hiring a full-service junk removal company to take care of everything on your behalf. While the second option may sound like the easiest one at first, it is not necessarily so. It can also be quite expensive to pay an entire crew of laborers to pick up material on your property and take it away for disposal. Obviously, the idea of packing all your unwanted material into garbage bags, cramming them into the back of your vehicle and driving them to the dump yourself is probably too labor-intensive. However, you should be aware that hiring a “full-service” junk removal company can also be inconvenient, especially if you have to take time off work or other planned activities to let their staff onto your property. Conversely, dumpster rental provides you with the ability to work on your own schedule. This can allow you to keep important commitments during your spring cleaning or in the aftermath of a project. Cost-effectiveness is a major deciding factor for most MA residents who are considering dumpster rental for their needs. As such, you probably want to know how to save the most money possible on your dumpster rental before you decide to book it. Choosing a company with the right fee structure is important, but there’s more too. For example, you will want to make sure that your dumpster does not contain materials that will result in extra fees, and that you place it in an appropriate area upon delivery so that it can also be picked up on time. What Should NOT Go in Your Dumpster? Knowing what not to put in your dumpster is one of the keys to affordable waste disposal around the home. You might think that just because you’ve rented a container, you can fill it with anything you want, but this is not the case. Screens that use cathode ray technology (like computers and TVs) will result in extra handling charges, as will car tires and batteries, propane tanks, white goods, appliances with Freon in them, and hard-to-manage items such as mattresses. Instead, stick to using your dumpster for things such as yard clippings, concrete, tree limbs, and other types of debris that are not flammable, corrosive, or explosive. If you are uncertain about what you can put in a rental dumpster, check our guide here. How Can You Make the Rental Period as Convenient as Possible? Another thing you can do to prevent stress and save money during your rental ensure the dumpster itself is placed in an easy-to-reach location. Doing so will make sure that the people who collect and drop off your unit will be able to do so without incident, and that you will be able to use the entirety of your rental period productively. It will also help you avoid the late fees that can occur when a dumpster rental company comes to pick up the container at the end of a rental and cannot access it. For best results, consider hiring a mini-dumpster like the ones we provide at Junk King. These units sit comfortably in driveways and allow for plenty of storage without blocking garage access or causing pickup problems. Whether you choose to rent a dumpster from us or to pursue other waste disposal solutions, it is essential to know precisely what dumpster rental in MA can help you accomplish. Use the information given above to make an informed decision about how you dispose of unwanted materials around your home and choose an option that will provide you with maximum satisfaction. For more information on our dumpster rental service in Boston, please call us on (617) 318-6888 and we’ll tell you more about it. This entry was posted in Uncategorized and tagged junk haulers, Junk King, Junk King Removal on October 12, 2017 by Julian Torres, "JT". Last updated January 21, 2018 .